This article has been amended to include factual corrections. To read the erratum, click here. The online article and its erratum are considered the version of record. To report early corneal biomechanical changes after corneal cross-linking (CXL) in patients with keratoconus. Thirty-four eyes of 34 patients undergoing CXL for progressive keratoconus were included in this prospective clinical study. 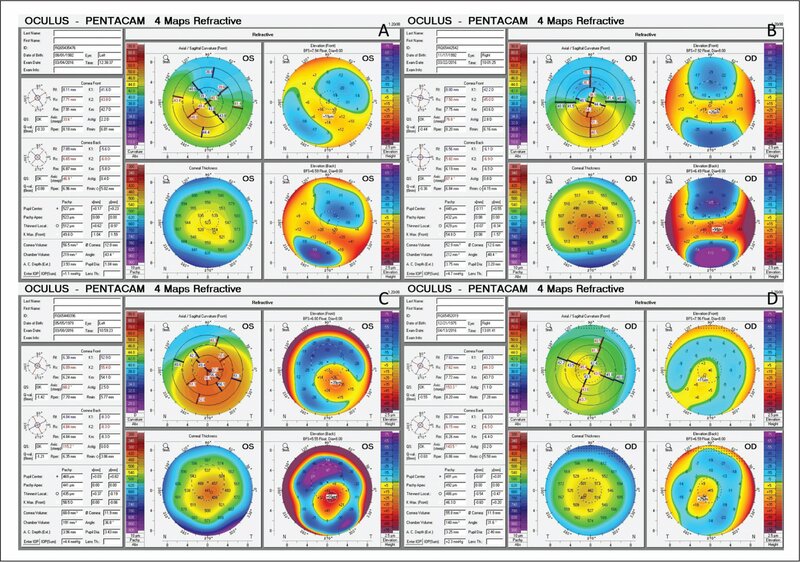 Dynamic corneal response (DCR) parameters obtained with the Corvis ST (OCULUS Optikgeräte GmbH; Wetzlar, Germany) were assessed at baseline (day of CXL) and after 1 month of follow-up; conversely, corneal tomography with the Pentacam (OCULUS Optikgeräte GmbH) was assessed at baseline and at 1, 3, and 6 months after CXL. At the last follow-up visit (123.7 ± 69.6 days), all morphological parameters including steepest point (Kmax) and thinnest corneal thickness (ThCT) indicated stabilization of keratoconus (P > .05). Comparative analyses showed a rise of corneal stiffness demonstrated by a significant increase of Stiffness Parameter A1 (SP-A1) and Highest Concavity (SP-HC) and a significant decrease of Inverse Concave Radius (1/R) and Deformation Amplitude Ratio (DA Ratio) (P < .05). There was a significant correlation between the preoperative keratoconus characteristics (Kmax, Belin/Ambrósio final D value [BAD-D], and ThCT) and the DCR parameters (P < .05). Kmax and BAD-D showed a significant positive correlation with DA Ratio, Deflection Amplitude (DefA), and 1/R and a significant negative correlation with SPA1 and SP-HC. ThCT showed a significant positive correlation with SP-A1 and SP-HC and a significant negative correlation with DA Ratio, DefA, and 1/R. This study suggests that the new DCR parameters of the Corvis ST are able to detect early changes in biomechanics following CXL and those that are measurable before corneal shape modifications take place. Based on these results, the authors suggest the use of these metrics to assess the early efficacy of cross-linking. The aim of this study was to measure the early biomechanical properties of the cornea before and after CXL using the DCR parameters obtained from the Corvis ST. In this prospective, single-center, clinical study, we included 34 eyes of 34 patients who underwent CXL at St. Paul's Eye Unit, Royal Liverpool University Hospital. 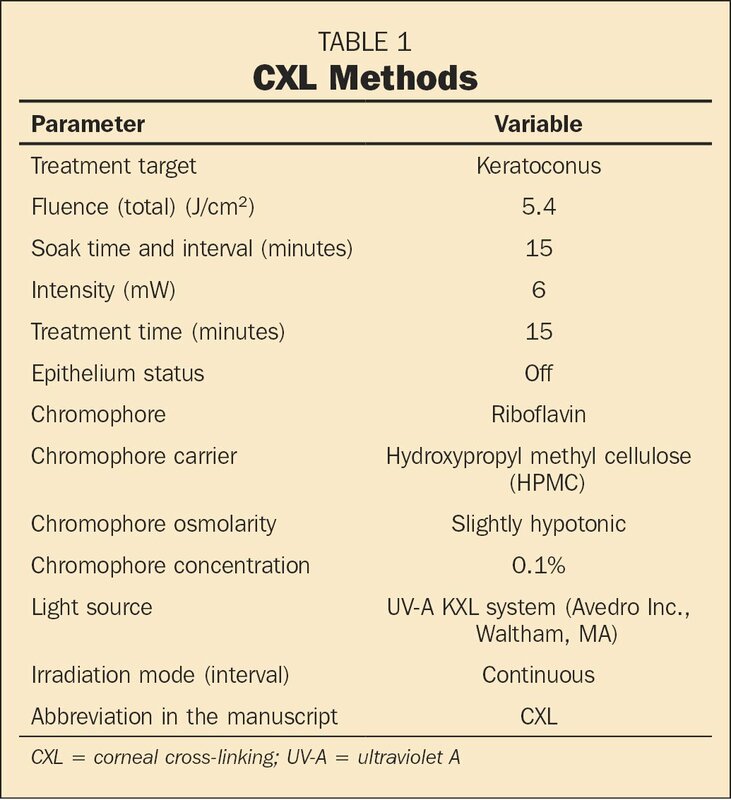 The inclusion criteria for the treatment of CXL were an informed consent and documented progression of keratoconus, which was defined as a change in the curvature within the cone area of at least 1.00 diopter (D) on instantaneous map with or without thinning of more than 20 μm in minimal pachymetry measured with Pentacam (OCULUS Optikgeräte GmbH) at least 3 months apart.21,22 Exclusion criteria were a history of herpetic keratitis, dry eye, severe corneal infection, and concomitant ocular or systemic autoimmune disease. Other exclusion criteria were pregnancy or breastfeeding, the presence of central or paracentral opacities, and the use of rigid contact lenses for more than 4 weeks before the baseline evaluation. The ethics committee of the Royal Liverpool University Hospital approved this prospective research study, which was conducted in accordance with the tenets of the 1964 Declaration of Helsinki, and revised in 2000. CXL was performed by initially administering a topical anesthetic and povidone-iodine drops in the eye followed by removal of the central epithelium with 20% alcohol using a surgical spear and irrigation of the eye with normal saline. CXL methods are outlined in Table 1. The treated eye was padded for the next 12 to 24 hours after application of stat chloramphenicol 1% ointment and cyclopentolate 1% drop. Patients were given chloramphenicol ointment, dexamethasone drops, and oral cocodamol postoperatively. At baseline (day of CXL) and 1 month after CXL, corrected distance visual acuity, slit-lamp biomicroscopy, biomechanical IOP14 (bIOP), dilated funduscopy, and corneal biomechanics were assessed by the Corvis ST. The bIOP value was derived by finite element simulations that take into account the influence of CCT, age, and DCR parameters.14 Corneal tomography was assessed at baseline and at 1, 3, and 6 months after CXL with the Pentacam. The DCR parameters evaluated in the current study were Inverse Concave Radius (1/R), Deformation Amplitude Ratio (DA Ratio), Deflection Amplitude (DefA), and Deformation Amplitude (DA). Specifically, 1/R and DA Ratio were included in the analysis because they have been demonstrated to be associated with corneal biomechanics and independent from intraocular pressure.16 Furthermore, we also evaluated two novel stiffness parameters: A1 (SP-A1) (included in the native software) and highest concavity (SP-HC), which was exported using the research software. These parameters, which have been recently described,17 are defined as the resultant pressure divided by displacement. The location of the cornea at first applanation (A1) is the reference for estimating the corneal load. SP-A1 uses the displacement between the apex in the non-deformed state and the deflection at A1 (A1DeflAmp). Conversely, SP-HC uses displacement between the A1 position and highest concavity, which is the maximum deflection amplitude (DeflAmpMax) minus deflection amplitude at A1 (A1DeflAmp). Resultant pressure was calculated as the air pressure impinging on the cornea at the time of applanation 1 (adjAP1) minus the bIOP. Statistical analysis was performed using the SPSS software (version 20.0; IBM Corporation, Armonk, NY). Data are described as mean ± standard deviation. All data samples were first analyzed using the Shapiro–Wilk test. The Wilcoxon ranked-sum test for paired data was applied to assess the significance of differences between preoperative and postoperative data using the same level of significance (P < .05) in all cases. 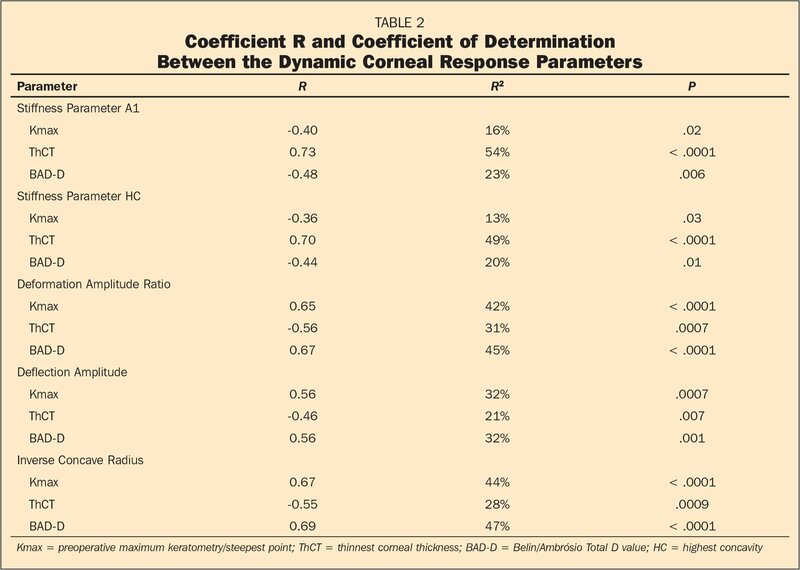 Pearson correlation and R coefficient of determination were calculated to measure the linear dependence between the DCR parameters and preoperative maximum keratometry/steepest point (Kmax) and thinnest corneal thickness (ThCT). A P value of less than .05 was considered significant. Thirty-four eyes of 34 patients (27 men and 7 women; 22 left eyes [64%]; age: 26 ± 7 years) were evaluated. Preoperative Pentacam-derived Kmax and ThCT were 56.3 ± 8.32 D and 452.7 ± 36.02 μm, respectively. The preoperative mean Belin/Ambrósio total D value was 8.90 ± 4.78. Using the Corvis ST, the central corneal thickness (CCT) was 467.2 ± 33 μm and bIOP was 13.3 ± 1.73 mm Hg. At the postoperative visit (4 to 7 weeks after surgery), Kmax and ThCT were 55.2 ± 8.32 D and 438.9 ± 39.1 μm, respectively. At the last follow-up visit (123.7 ± 69.6 days), Kmax and ThCT were 55.2 ± 8.95 D and 441.2 ± 35.2 μm, respectively. All morphological parameters showed non-significant changes, indicating a stabilization or mild flattening of keratoconus (P = .10 for Kmax, .20 for ThCT). Using the Corvis ST, the postoperative CCT and bIOP were 447 ± 46 μm and 15.0 ± 4.8 mm Hg, respectively. There was a significant difference between preoperative and postoperative bIOP and CCT (P < .05). In our report, 17.6% of patients (6 of 34) showed a central cone (see Figure A [available in the online version of this article] for examples of central and peripheral cones). No significant difference in Corvis ST parameters was found between central and peripheral cones. Two examples of (A–B) peripheral and (C–D) central cones. There was a significant correlation between preoperative morphological parameters (Kmax, ThCT, and BAD-D) and Corvis ST parameters (Table 2). The main outcome of this subanalysis was that Kmax and BAD-D showed a significant positive correlation with DefA, DA Ratio, and 1/R and a significant negative correlation with SP-A1 and SP-HC. Similarly, the main outcome of the correlation analysis was the significant positive correlation between ThCT, SP-A1, and SP-HC and the significant negative correlation between DefA, DA Ratio, and 1/R. Comparative analyses between baseline and 6 weeks of follow-up showed, as a main outcome, a rise of corneal stiffness demonstrated by a significant increase of SP-A1 and SP-HC and a significant decrease of 1/R, DefA, and DA Ratio (Table 3, Wilcoxon paired test). A significant decrease of DefA was also found. Details of each of the Corvis ST parameters before and after treatment are shown in Table 3. No correlation between corneal flattening or corneal thinning after surgery and Corvis ST parameters was found at any follow-up visit. No patients were lost to follow-up. The evaluation of the efficacy of CXL in the first months after the procedure is of foremost importance, but the well-documented decrease of corneal thickness, reduction of visual acuity, and increase of curvature in the first postoperative months make this task complex.22–26 The demarcation line has been proposed to be a good indicator of the efficacy of the procedure,27,28 but it is only an indirect index of the efficacy. The ideal way of judging the outcome of CXL would be to directly assess its stiffening effect. Given this objective, our study aimed to evaluate the capability of the Corvis ST to detect the early biomechanical changes induced by CXL. Our comparative analysis between before and after CXL confirmed this hypothesis, showing a significant rise of corneal stiffness as a main outcome. This was demonstrated by a significant increase of DCR parameters such as SP-A1 and SP-HC and a significant decrease of 1/R, DefA, and DA Ratio. The understanding of in vivo corneal biomechanics is of crucial importance to evaluate these results. In general, a stiffer cornea would be deformed less by the air puff, which would be detected by the Corvis ST with a higher radius of concavity. However, the Corvis ST displays the inverse of the radius of highest concavity, so, as in the results of the current study, a stiffer cornea would show a decrease of 1/R. Similarly, a stiff cornea would be less prone to be deflected (lower deflection amplitude). However, it should be noted that DefA is largely dependent on IOP,16 so this result might be influenced by a slight change in IOP between before and after CXL. The stiffness parameters (SP-A1 and SP-HC) were developed by Roberts et al.17 They are defined as resultant pressure divided by displacement. In both parameters, a stiffer cornea would show higher values of either SP-A1 or SP-HC. It is interesting to note that, even if SP-A1 has been reported to be of greater clinical utility for corneal conditions and SP-HC has been hypothesized to be superior for clinical conditions involving the sclera or the lamina cribrosa, such as glaucoma,17 they were both increased after CXL, although with different P values. There was a significant correlation between the preoperative keratoconus characteristics (Kmax, ThCT, and BAD-D) and the DCR parameters; conversely, no significant difference was found between central and peripheral cones. The relative low number of patients with central cone compared to peripheral cone might explain this last finding. 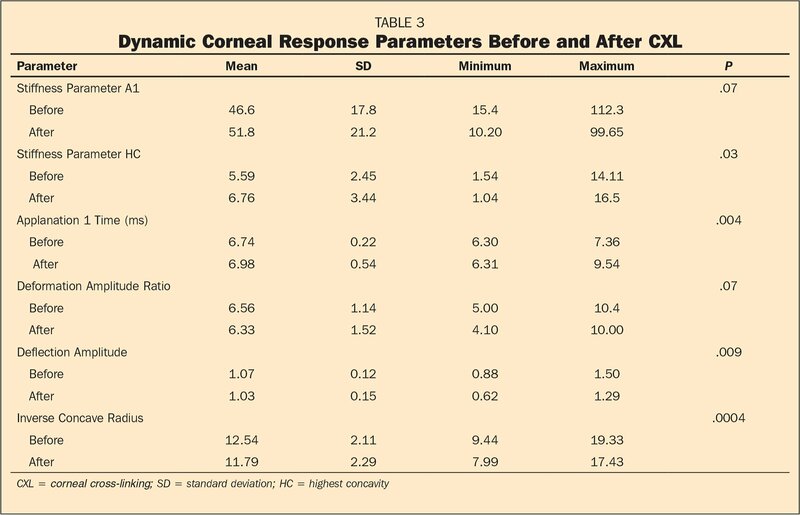 These results confirm previous studies, which showed that the assessed DCR parameters are suitable to evaluate corneal biomechanics.11,16,19,20 Furthermore, the more advanced the keratoconus is, the more these parameters are altered, showing soft corneas. The non-significant difference between central and peripheral cones is probably due to the relatively low number of patients evaluated, but the evaluation of this difference was not the primary aim of the study. The comparative results also showed an apparently inexplicable increase in bIOP, but it should be noted that the bIOP equation was not developed specifically for patients with keratoconus who have an abnormally shaped cornea that would influence the calculation. Furthermore, the equation assumes that a stiff cornea would also be thicker.14 In this case, conversely, the stiffer corneas after CXL are thinner and this would not satisfy the empirical assumption. Another possible explanation of this finding is a possible difference of time of measurement. As a matter of fact, some patients had the CXL procedure done in the afternoon, whereas all of the cornea clinics were in the morning. For this reason, these results should be considered with caution. One study is in progress to create an IOP equation, similar to bIOP, which will also be applicable to patients with keratoconus. The comparative results also showed the absence of correlation between corneal flattening or corneal thinning after surgery and Corvis ST parameters. This result, which might also appear counterintuitive, is explained by the fact that mechanical changes after CXL are immediate11,29 and, conversely, the cornea is viscoelastic,30 so the morphological changes are known to take more time to appear.22 A possible significant correlation might be demonstrated when the corneal shape also changes under the effect of CXL (at least 3 to 6 months after surgery). A prospective study is currently underway to evaluate this possible correlation. Previous studies either were not able to show any significant change in DCR parameters 1 year after CXL32 or demonstrated some statistical changes only for the DA (largely influenced by IOP), the highest concavity time, and the second applanation (A2) time after 3 months.15 No early changes were reported. A recent study evaluated the change in the biomechanics with the Corvis ST 6 months after CXL.34 The authors showed a significant change of peak distance and the radius of highest concavity after 6 months using the standard software. Furthermore, they also evaluated the dynamic curve analysis with promising results. Once more, the new DCR parameters were not assessed. The ORA has been widely used for the evaluation of corneal biomechanics. However, when applied to the in vivo evaluation of the effect of CXL, most of the studies were not able to show any effect on the ORA deformation parameters.6,8,33 Nevertheless, one report showed a significant increase of corneal hysteresis and corneal resistance factor intraoperatively and 1 month after CXL,11 whereas another study did not find any significant change in corneal hysteresis and corneal resistance factor but found a significant increase in the area under peak 2.9 In general, it is clear that the ORA is not able to demonstrate, in a repeatable way, the well-known stiffening effect in vivo and the contradictory literature is proof of that. Additionally, the high irregularity of these corneas may introduce error and variability into the ORA signal that may preclude a quantitative comparison of preoperative and postoperative corneal hysteresis and corneal resistance factor. It is also possible that the biomechanical changes after CXL are inherently different from those measured by corneal hysteresis and corneal resistance factor, and therefore these metrics may not capture the true biomechanical effect of CXL over time. The limitations of this study were the relatively low number of patients and the short-term follow-up. This prospective study is still in progress to confirm these findings in eyes with longer follow-up. This study suggests that the new corneal deformation parameters of the Corvis ST are able to detect early changes in corneal biomechanics following CXL and are measurable before corneal shape modifications take place. This finding would have a direct impact on the clinical evaluation of the outcome of CXL. Based on these results, we suggest the use of these metrics to evaluate the early efficacy of CXL. Roberts C, Mahmoud A, Lembach R, Mauger T. Corneal deformation characteristics and IOP before and after collagen cross-linking. Invest Ophthalmol Vis Sci. 2013;54:5272. From the Department of Corneal and External Eye Diseases, St. Paul's Eye Unit, Royal Liverpool University Hospital, Liverpool, United Kingdom (RV, VR, EMA, MBrunner, CEW, MBatterbury, SBK); and the Department of Eye and Vision Science, University of Liverpool, Liverpool, United Kingdom (CEW, SBK). © 2017 Vinciguerra, Romano, Arbabi, et al. ; licensee SLACK Incorporated. This is an Open Access article distributed under the terms of the Creative Commons Attribution 4.0 International ( https://creativecommons.org/licenses/by/4.0). This license allows users to copy and distribute, to remix, transform, and build upon the article, for any purpose, even commercially, provided the author is attributed and is not represented as endorsing the use made of the work. Dr. Vinciguerra is a consultant for OCULUS Optikgeräte GmbH. The remaining authors have no financial or proprietary interest in the materials presented herein. Copyright 2017, Vinciguerra, Romano, Arbabi, et al.